​Completed in 1971, Lesley Terrace (formerly known as Bonnie Brae Terrace) was built in partnership with HUD. A four-story facility, Lesley Terrace has 138 studio apartments, 12 studio alcoves, and 14 one-bedroom units. 60 of our units provide rent subsidies to residents through the HUD Project-Based Section 8 Rental Assistance Program. 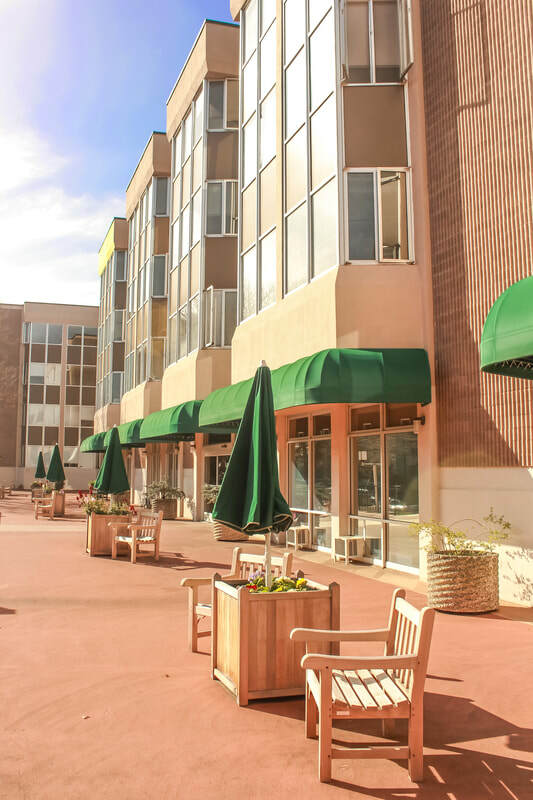 Nestled in the green hills of Belmont, Lesley Terrace is peaceful and serene, yet conveniently located just blocks from the local shopping center, public library, senior center and public transportation. Lesley Terrace provides housing and a mandatory meal program. An integral part of the services offered at Lesley Terrace is the role of the Social Services Coordinator, who assists residents to maximize their independence while advocating and empowering individual strengths through the aging process. The Social Services Coordinator links residents to supportive services and community resources, including but not limited to transportation, homecare, counseling, financial management, and health care. Assistance is offered on a confidential basis with respect to each individual’s dignity and unique circumstances. In collaboration with community partners the Social Services Coordinator organizes monthly forums to provide information related to issues of positive aging and wellness. ​The convenience store on-site is run by the Residents Association, which has an active voice in residential community affairs. Management staff is available during regular business hours, and maintenance emergency repairs are provided 24/7. Applicants to the basic rent units must earn less than the Low income limit, and applicants to the Section 8 units must earn less than the Very Low income limit, as classified by HUD. Lesley Terrace has limited availability for housing for people under 62 with a disability. In 2007, HUD awarded Lesley Senior Communities the first Assisted Living Conversion Grant in California. This grant enabled us to convert 24 units at Lesley Terrace to affordable assisted living units. Please visit the Assisted Living page for more information.